Life is too short to settle for surveys. With features to meet any business needs, 123FormBuilder is actually much more than a survey builder. If SurveyMonkey doesn’t quite fit your needs, consider using 123FormBuilder and get more out of your online surveys! Why choose 123FormBuilder over SurveyMonkey? 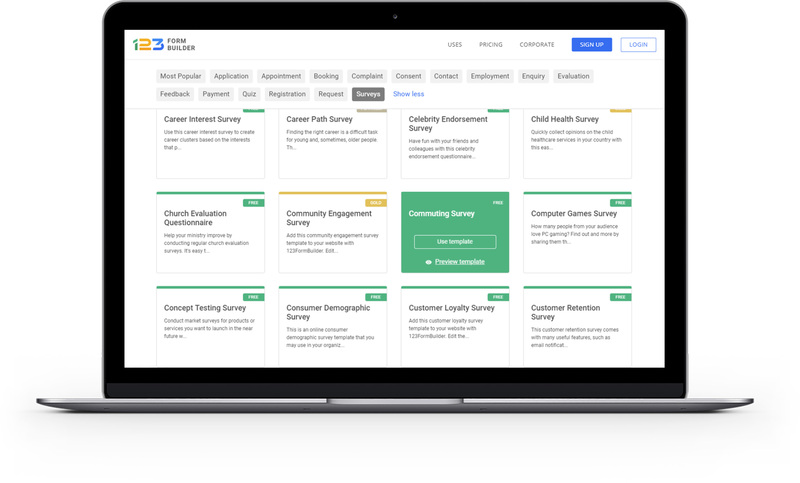 Both 123FormBuilder and SurveyMonkey provide a simple method for creating online surveys, which is great for both individuals and organizations. But what if you’re looking for a form builder that does more? Users all over the globe use our platform to create flexible, yet powerful web forms that they use for a large variety of situations. To name just a few, you can work with 123FormBuilder to sell online, organize events, book accommodations, create powerful quizzes and manage email marketing. Additionally, digital forms optimize data collection for project management, HR processes, and lead generation. We also work at the enterprise-level, automating workflows and taking productivity to the next level. In short, regardless of your line of business, we’ve got you covered. With over 1300 form templates to choose from, it’s easy to get started, whether you are a freelancer, an educator, a healthcare professional or work in a company or a governmental agency. 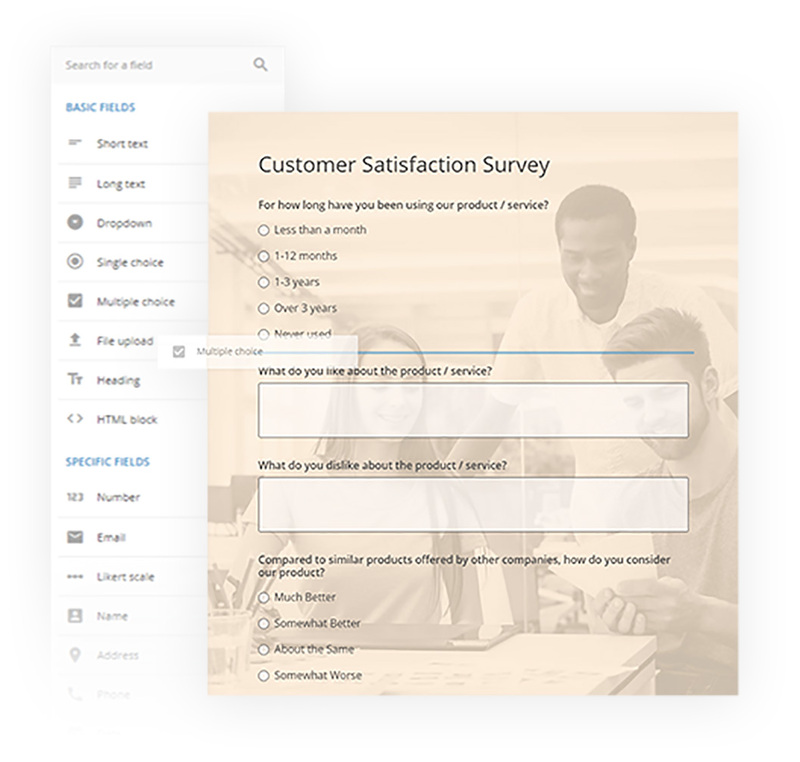 Besides providing +50 free survey samples to choose from, our template gallery helps you build every type of web form starting from a pre-designed model. And we’re constantly adding to our collection of form templates, so don’t be a stranger! Build beautiful web forms with more brand control! With plenty of design options and more than 30 predefined form themes, you can completely customize the look & feel of your forms. Add your own logo on any survey or web form without having to pay a dime! And if you prefer to use your own CSS, we don’t mind. BONUS: Design your own custom Thank You page and let your respondents relax knowing their answers were submitted. Available even for the Free plan. When you’ve finished creating your survey, our Publish panel will provide you with a large array of sharing options. Set up surveys and other forms in different languages to comfortably engage your international audience. While constructing your form, you can apply translations to fields, instructions and system messages, even while in the Free plan. Securely sell online and collect donations through the payment system you prefer: PayPal, Authorize.net, Stripe, Braintree, WorldPay, PayFast, Sisow, Sage Pay, PayU, FreshBooks or Square. If you have a paper or scanned form that you want to digitize, just take a picture or a screenshot, then import the JPEG or PDF file via our Scan to Form option. Using machine learning, this tool has handwriting and form recognition capabilities and will help you if you’re not in the mood of creating a web form from scratch. 30 days money-back guarantee for paid plans. Check our Features Matrix to compare plans.